Only advice I have is I've lined a skirt with cotton before and the outside was cotton and it tends to hitch up and think it's the lining clinging to the outer and pulling it up. How about one of those anti static linings? I know it's man made fibres but find them a better lining for A-line skirts than cotton. How about you keep the silk lining on the bodice if that now fits ok so at least you haven't got man made fibres on your top half to keep you cool and you won't have to cut out that part again? Good luck! It's awful when something goes wrong and am really sympathetic to your dilemma. I have no advice to give, but I wish you lots of luck with it! I take my hat off to you. I would have given up ages ago, or most likely not even started! Yikes, it must be a pain to sew with it on the bias! It is pretty though. oh no!!! Sorry to hear about the lining conundrum! What about a slip? Or you could try underlining (attaching the pieces together and treating as one piece)? I don't know how that will behave with something cut on the bias though! Ouch, that can be frustrating! I second what Debi says, maybe trying a batiste underlining? Just a guess though, hopefully someone who has made this will be able to help you. It is a gorgeous dress though! Wow Jane, you are one determined lady! Good luck with it all, with your skills you will end up with one gorgeous-looking dress, no doubt about it! I've seen some anti-static lining that might work, or like Debi suggested...how about a slip? Oh dear, what a nightmare. Mena at Sew Weekly just made one of these and used a slip instead of a lining so that may be the way to go?? Maybe like Maire suggests an anti -tatic lining would work, but hate the way they stick to my body when i get hot, so I'm with magpie mimi in keeping the silk for the bodice lining. Hmm good luck on this quest. I can't provide any practical advice, except agree with your decision to step away for a while, in case you make a hasty decision. That cutting diagram looks pretty intimidating! Oh, Jane! I feel your pain SO much. All that work; all that frustration; all that money wasted. I wish I had some words of advice but I don't. I've never tried working with a silk lining, but I can totally understand all the problems you've been having ie with finishing the seams and the fabric moving the minute you touch it with a pair of scissors. All I can say is WELL DONE YOU for persevering. You are a saint amongst sewists. And oh - you're right. The silhouette is va-va-voom! Working with bias cut patterns, pieces and garments is a little rotten isn't it? This is very similiar to how my first bias project turned out and I swore up and down that I would never touch bias again. But I've learned a few tricks since then. I don't think all is lost here, but here are some of my own tips. Don't finish the edges with a serger - not that you did - instead pink or zigzag after you sew the seam. Definitely using a slinky silk fabric is harder to work with. I think that if you try a cotton lawn it will work better for one of your first times working on the bias, but I think you can still selvage this piece too! Oh I do know how you feel! Bias is so tricky! But gosh look how lovely it just hugs those curves! Hopefully this helps a little! No advice, just total admiration! Sorry the Goldhawk silk's not worked out as you planned Jane. It will be a killer dress though, but I feel your pain! Slinky fabric + bias = super challenge. I'd also be tempted with a slip too .......but I reckon you've got the grit to master it, so well done for where you've got to so far! So sorry you had the trouble with the lining.That is so frustrating,isnt it? I noticed someone else had mentioned that Mena of sew weekly did the oolong with out lining it.. She stated that she had talked with Sarai [colette patterns] and she said it would work fine with out lining.. I have this pattern and I intend to not line it. It has facings already,so I think it would work fine. If I were going to line it ,I think I would try the batise cotton.It would be soft and easy to handle. I have a question too..On the pattern..am I understanding it correctly....that you take the bodice and lay on top of the dress skirt and sew on top of it, instead of putting the right sides together and sewing them?? Would apprecaite your help on this one.. Really didnt understand it?? thankyou..
Hi I've just found you via didyoumakethat? I have looked at the OoLong Pattern several times and nearly bought it so I'm interested to see how it makes up, I shall be following the progress. P.s. 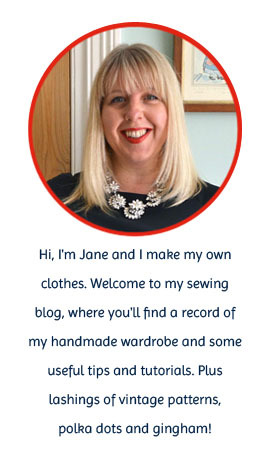 I'm Janey and known in my family as Janey that makes stuff so felt a connection as soon as I saw your blog title! Is that a polyester lining fabric? That is notorious for being staticky (is that a word? LOL). Ambience lining (made from rayon) can be tricky to handle, but is not particularly prone to static. I really like it. Silk linings are also nice. One thing you may try is starching the slippery fabrics to make them more manageable. Test on a sample square and see how it washes out. Hi Jane! I tried to comment several times yesterday but Blogger wouldn't have it so I'm trying again. First, thanks for the link and the compliment! I do love this pattern. I did what Sunni suggested: lightweight paper pinned to the fabric to help keep my seams straight. I couldn't keep the Bemberg rayon lining fabric from slipping without it! I serged the seams though, which Sunni is saying not to do with bias fabric, whoops! Interesting that she's saying you can just wait until the end to let the fabric hang (rather than do the individual pieces at the beginning, which I did). This pattern definitely ran small on me too. I went 2 sizes bigger at the bust than what the pattern chart says I measure. When I saw Mena's use of a full slip I thought it was genius! Looks like others beat me to the punch on that one. I hope you keep going with this one because I absolutely love your fabric choice and I think we agree the Oolong needs more representation out there! I wonder if a walking foot on your machine might help - just an idea. I was using mine yesterday to stitch polyester wadding to cotton bag pieces, and everything stitched together beautifully without the wadding slipping, rucking or tucking as it usually does. In fact I wondered why I don't use it more often! 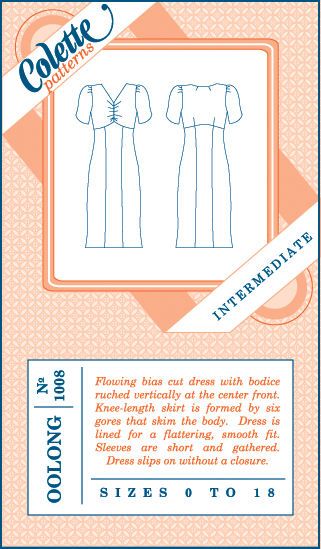 Other than that I don't have any advice to offer with bias sewing. Don't loose heart, keep going and wow us all with your stunning Oolong creation.